EGEE'09 starts tomorrow but already a few of us are in Barcelona. I hit the town last night with Gillian from the NGS, some great little "hole in the wall" bars around the place. Today I got up early (for a Sunday) and headed out on the train to Figueres (Dali's home town). The train journey was longer than my flight but so worth it. Amazing installations, statues, paintings, holograms and jewellery, he tried his hand at everything. 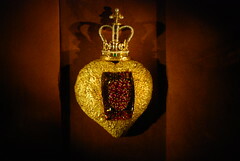 The picture with this article is a jewelled heart which actually beats! Anyway I better go register I suppose and set up the UK and Ireland federation stand. We have lots of freebies (including rucksacks) some come visit us and nab some free stuff.